I heard some meowing early in the morning, but couldn’t see from the window where it was coming from. When the sound kept repeating in the evening, we decided to have a look. There had been some construction going on for a while and since some days a fence was built around the area behind the apartment building. Passing dirty, old clothes, a rotting skull and other trash, we found a little kitten completely alone, somewhere behind the fence. 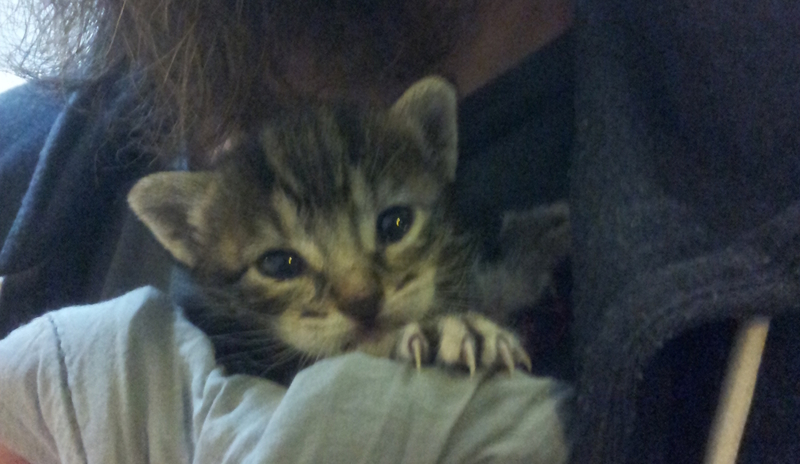 I managed to squeeze myself under the fence to pick up the kitten. It was very loud but could barely crawl or see. At home we made a little bed for it and gave it a bath first. The water turned brown; it was full of sand. One eye was closed, the other half-open, full of eyecrust. During the bath, it finally drank a little water and its eyes (still blue) opened. After a quick research on the Internet, we came to the conclusion that it was about 2 to 3 weeks old. We put it in his new bed that it immediately pissed on. It didn’t feel like resting yet and tried to escape its new home. After some time the meowing became less, until it got used to us a bit. A friend of our roommate came over with soy milk. She said it would be suitable for a kitten. We had a look around for a pet shop, hoping to find some appropriate milk. It was too late for the shops to be open though. When coming back, the roommate and her friend were already calling every number they could find to search for an animal shelter or an ‘animal ambulance’. Why were they interfering with our cat? Also, they were already inviting everyone they knew to come and have a look. The poor kitten started to meow like in the beginning, not understanding why those people were touching it. We were hoping to keep our new pet for a while but our roommates taking control was a bit too annoying so we decided to take it to the vet before they ran off with it. Luckily, the vet was open all night. Finally, it fell asleep against my chest while I carried it there. They couldn’t take it in at first, but they did have some expensive powdered kitten milk. Unfortunately, the care would be a strain on our budget and its loud meowing would easily be heard by anyone checking the apartment where pets are not allowed. The receptionist disappeared for a while to check with ‘the chief’ and came back saying they could take it in anyway. It was a bit disappointing we couldn’t keep it but at least “Lisboa”, as we named it, will be taken care of. Hello, I chanced upon, and read, the section you wrote about what you guys cannot understand about Lisbon. I found it very interesting, thank you very much: I now feel like I had been there. knowing that would help me understand why you find that size of coffee cups “not normal”, and why baguette is not normal bread for you, etc. Because you complain about the lack of variety in the beer field, I suppose you are from the UK? It would be helpful if you could remind your readers where you are from, at every page. The Portuguese bica or coffee is very tasty, but we prefer bigger cups, less strong. That’s an Americano for the Portuguese.